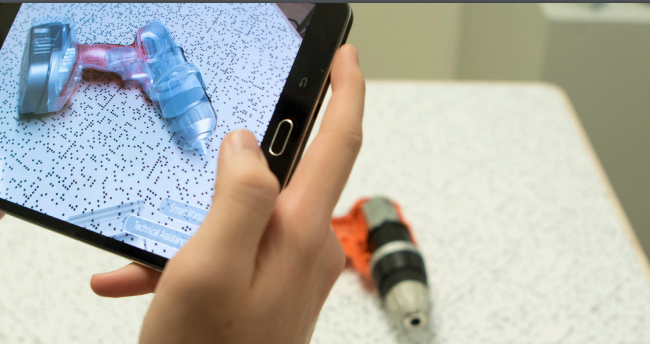 Our solution, Symmetra, uses augmented reality to enable maintenance service professionals to handle their machinery in an interactive, user-friendly way. It adds information in layers of computer-generated content over real-life objects, enhancing the user experience and perception of reality. These layers build up the real world that responds dynamically to its changes. Our main objective was to empower the machine users by offering them a tool that provides step-by-step guidance while they perform maintenance activities. It is important to note that these professionals will have to rely on their hands to actually carry out the work. Consequently, we must offer them a hands-free gadget. Our proposal is to use an augmented reality headset, such as Hololens from Microsoft. Our proposal design is based on a user-friendly interface that eases the complex task of understanding how the machinery work and a really practical user experience so as to speed up the process of learning how to use the system.